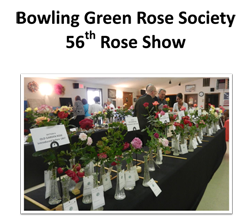 The 2019 Bowling Green Rose Society Rose Show is on May 18, 2019, from 1:00 to 4:00 pm. The show will be held at the American Legion Building, Dishman Lane, Bowling Green, KY 42101. BGRS invites all Nashville Rose Society members to come and exhibit at the show! Entries may be made from 7-10 am. We are a small show and would love to have exhibitors from NRS! Click here for our Rose Show Schedule. For more information, visit the Bowling Green Rose Society website at http://www.bowlinggreenrosesociety.org/.